A little over a year ago, China was hailed as a country that was “stepping up” to combat climate change. After all, the country had agreed to sign on to the Paris climate accord and to emphasize renewables (wind and solar) in new power generation. The commitment to the Paris climate accord was apparently more symbolic and rhetorical than substantive, however. 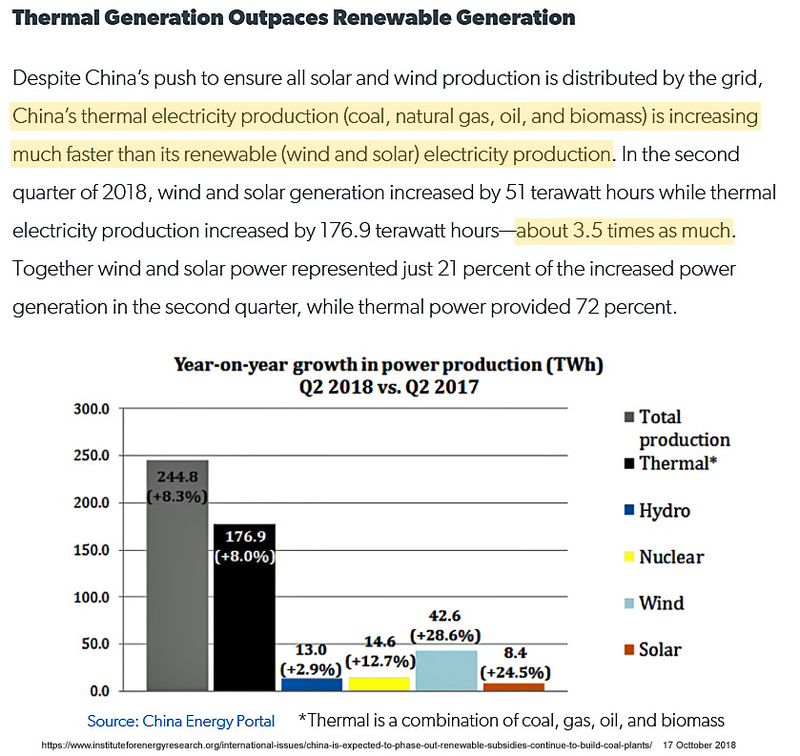 China’s fossil fuel-based energy production is currently (2018) increasing 3.5 times faster than its renewables (wind and solar) energy production as the country phases out renewable subsidies and returns to building more coal plants. China is by far the top CO2 emitter in the world, by itself accounting for about 30% of the globe’s overall yearly emissions. And in 2017, China again led the world in CO2 emissions increases. Citing the extraordinarily high costs (a price tag of $2.4 trillion per year according to the latest IPCC report) and an “unfair” burden to US taxpayers, the United States symbolically rejected the Paris climate accord in June, 2017. 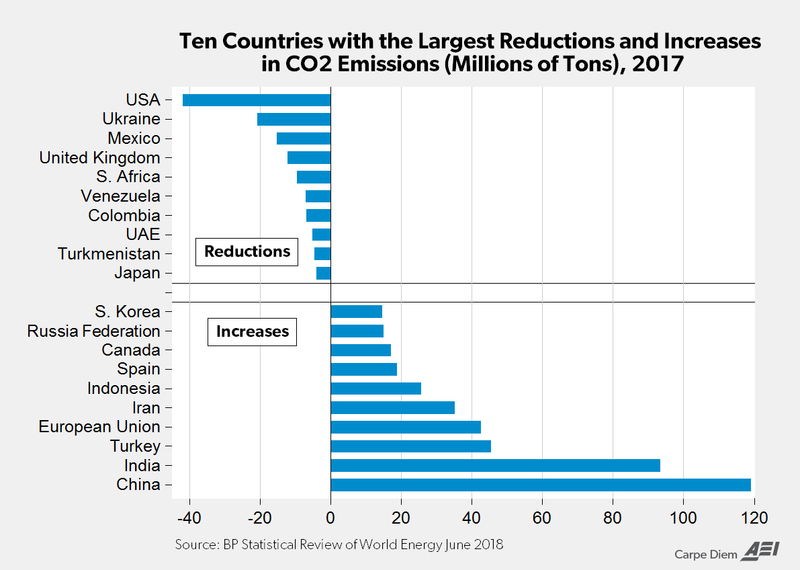 And despite this rhetorical “backing away” from CO2 mitigation efforts, the U.S. continued to lead the world in CO2 emissions reductions during 2017. Why has the U.S. been so successful in reducing its emissions? Primarily because the country has continued replacing coal-fired power generation with much cleaner natural gas, which halves emissions relative to coal as it supplies readily-available and reliable energy 24 hours a day, 7 days a week. 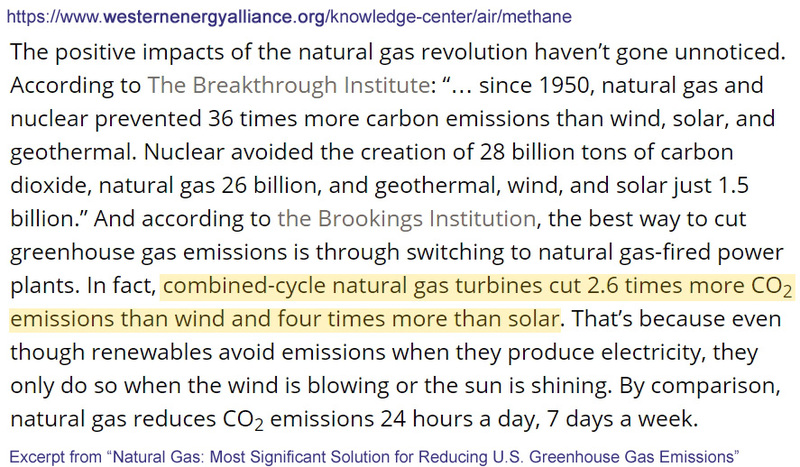 Natural gas cuts 2.6 times more CO2 emissions than wind and 4 times more CO2 emissions than solar. Due primarily to the CO2 mitigation afforded by transitioning to natural gas, the U.S. has already (2017) met its emissions targets. Though still high relative to most countries in the European Union, the United States’ per capita emissions have fallen rather precipitously this century. Again, this is mostly due to the aforementioned transition from coal to natural gas power generation. The U.S. now (2016) ranks 16th in the world in CO2 emissions per capita (15.56 tons). 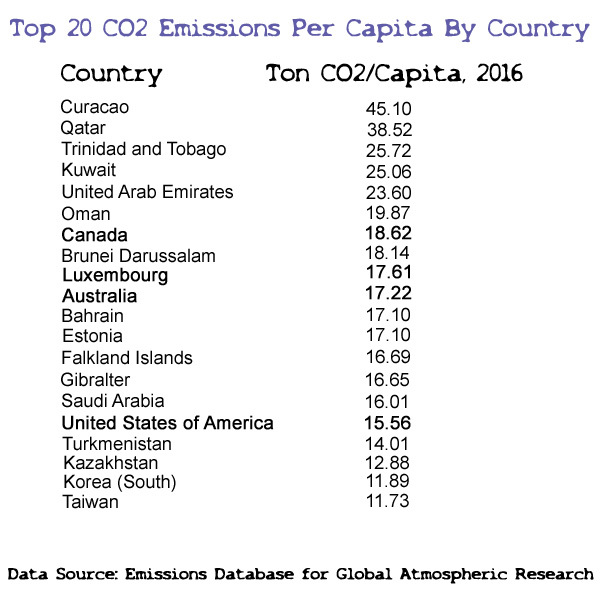 This rate is well behind Canada (18.62), Luxembourg (17.61), and Australia (17.22) – other wealthy countries that have, unlike the U.S., signed on to the Paris agreement. As of 2000, or before the large-scale transition to natural gas, U.S. per capita emissions stood at 20.60 tons, up slightly from the 1990 rate (19.59). With the dip to 15.65 tons by 2016, the U.S.’s yearly per capita emissions have thereforedeclined by about 25% in just a decade and a half. In contrast, China’s yearly per capita CO2 emissions output has risen from 1.97 tons in 1990 and 2.84 tons in 2000 to 7.45 tons per capita as of 2016. That’s an increase of 378% since 1990 for this developing country with nearly 1.5 billion people. At this rate, per capita emissions in China may exceed the U.S. rate within the next few decades. Between China and the U.S., the country that is headed in the “right” direction – reducing CO2 emissions, closing coal plants, and purportedly mitigating climate change – is the one that has rejected the Paris climate accord and its commitments. And the country that is veering off in the “wrong” direction – increasing its CO2 emissions and rapidly building more coal plants – is the one that agreed to sign on to the Paris climate accord and the concomitant emissions reduction commitments. The U.S. – not China – is acting in a way that aligns with the spirit and the goals of the Paris climate agreement. And yet because symbolism and rhetoric seem to be the primary focus as it relates to governmental CO2 mitigation policies, it’s China – not the U.S. – that is lauded for its “leadership”. Again, China is (easily) leading the world in overall CO2 emissions and in the construction of new coal plants. It’s also producing 3.5 times more electricity from fossil fuels than from wind and solar in its new power generation. And yet China is astonishingly hailed as the “new low-carbon champion” for its “climate mitigation leadership” in a new paper published in the journal Nature. China’s anointed position as a climate change mitigation leader and champion is baffling in its irony.